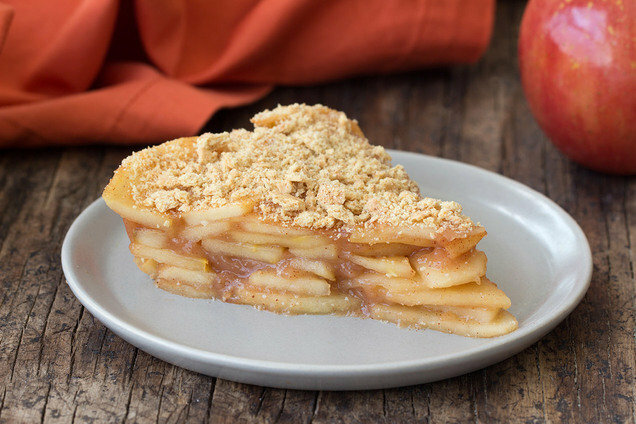 Homemade apple pie doesn't have to be complicated. Or loaded with sugar. Or include a buttery crust. But it does have to be incredibly delicious... Some traditions are worth clinging to! Spray a 9" deep-dish pie pan with nonstick spray. In a large nonstick pot, combine cornstarch with 1 1/2 cups cold water, and stir to dissolve. Add all remaining ingredients except graham crackers. Mix well. Set heat to medium. Stirring frequently, cook until apples have softened and mixture is thick and gooey, 12 - 15 minutes. Carefully transfer filling to the pie pan, and smooth out the surface with the back of a spoon. Refrigerate until chilled and set, at least 4 hours. Just before serving, sprinkle with crushed graham crackers. It's pie time for everyone -- click "Send to a Friend" ASAP!